a stoic shaman guarding forgotten ancient sciences. You seek triumph and technology, winning it with mutations and magic, soaked in the radiation and quantum fields of the altered, the savage, the semi-sentient, and the artificially intelligent. 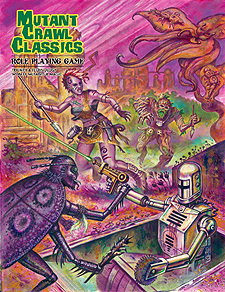 MCC RPG is a complete role playing game of 1970s post-apocalyptic science-fantasy.